If I wasn’t out of town, near Annapolis, Maryland, I would have met a mentor and hero of Brazillian Jiu Jitsu, Rorion Gracie this weekend. To make up for my missed attendence, I bought the Gracie Diet book on Amazon.com. Note, the electronic version was not available yet. After I have read the book, I will give the diet a try for six months. If the diet goes well, I will make the Gracie Diet a life long diet. I will make comments upon the book and also keep you all advised about how the diet is going on. I don’t want to violate any copyrights. Etc. Since I started studying Gracie Jiu Jitsu, I have yet to meet a fellow student following the Gracie Diet. What I’m just learning is the Gracie Diet, healthy eatting, is equal to learning how to do self defense. This week, a guy asked me to stay for sparring class on Thursday. I didn’t. I have thought about it about twenty times since then. I know that is what I needed to do. The people there are looking for fresh blood. I put sparring and throwing off because of the Helio Gracie Tournament. I am slowly changing to a more advanced training program. Also, I have an ongoing shoulder injury, shoulder bursitis, but I know that ice and anti inflammatory drugs will get it back to no pain. I just need to rest. I found some strength exercises for rotator cup strengthening. I notice that it gets inflamed when I workout with heavy weight class, specially, the bear hug moves. I could barely get my arms around the opponent. My arm lengths gets strained and causes damage to my shoulder. I will be out-of-town during the Gracie Diet Seminar given by Rorian Gracie. It is open to the public on October 27. I would definitely be there if I could. Really, it is an honor that such great Brazilian Jiu Jitsu instructors and role models come to the studio. Everyone gets rages for time to time. The trick is recognize pre rage signals before it rises and disengage. Is this situation worthy of violence? Is this worth dying for? I came up with a few examples that seem to get a lot of rage, a bad driver almost causes an accident, cutting in line, stealing a parking space. I believe these events aren’t worth causing injury to someone. I have been reviewing judo throws in preparation for Tuesday’s throwing class. I stopped many months ago so that I could focus on the self-defense fundamental classes. Some throws are safer than others in a street fight situation. Recently, I am starting to see myself become a purple belt. I didn’t have that vision before. A week has passed since the self-defense tournament. I am not the same. Well, that’s what I keep tell myself. I have a higher understanding of the self-defense program because of my pre test preparations and also the knowledge from the event. That was a great consequence of the tournament. I believe or hope next years event will have a greater turnout. So, I am promoting the event when ever I get a chance. What needs to be done now is an over haul of my training. For one, I need to take the advanced techniques class every week. I will alternate sparring and randori because its to harsh on my body. I need to communicate with my sparring and randori partner that I am not going for the an olympic metal, nor am I an MMA fighter, and this is just a dojo. The truth, I’m a middle age guy with a bum right shoulder. The Tournament was mostly higher belts and no white belts. This tournament has some similarities to kata, but more practical in regards to immediate self-defense. There were half as many people from the year before. With higher belts, it means harder competition. No one from last year made it into the third round except for a youth contestant. No one was able do the Haymaker defense correctly. A purple belt won the event. First off, I had a great time; even though I failed in my goal to get past the 1st round, but I did get another stripe. 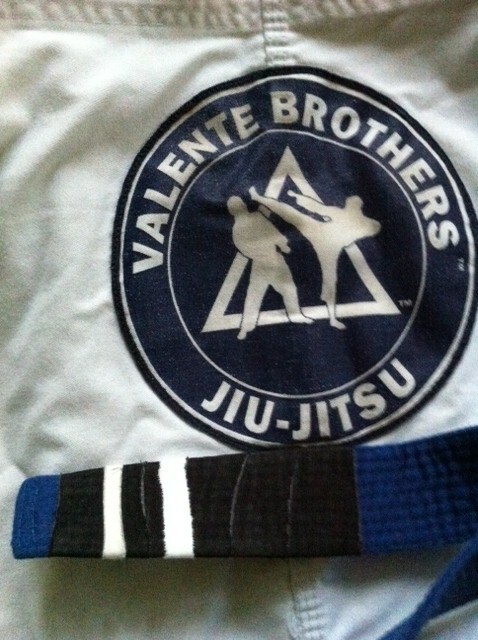 Sadly, with my second stripe, I can visibly see the passing of time. As per my January goals, I wanted to make it into the second round. I think I was close. Unfortunately, they don’t give out the evaluation; however, I will request feed back. I’ll let you know how that goes. Before the match, purple belt, Robert, gave some quick tips. Take your time in the move. This would allow me to be more thoughtful in the all the details. Make sure not to throw anyone which would be an automatic point deduction. On the other hand, Oggie, another purple belt I trained with, went full speed. Oggie made it into the third round. Some of the black belt judges were the guys that had taught us the techniques. Final message, Pedro and Gui both emphasized the importance of not changing the self-defense teachings of Master Helio Gracie. This means by not changing the teachings of Helio, Helio Gracie Jiu Jitsu will be preserved for the next generation. I couldn’t agree more.